Fawehinmi Oyinkansola is a founding partner at Legalbyte a boutique law firm servicing the creative industries in Nigeria. She heads the music, film and fashion portfolios of the firm. Oyinkansola popularly referred to as “Foza” has successfully pioneered the emergence of many revenue streams for consortium of producers for the publishing of their catalogues. She also played a pivotal role in daily management and administration of The Sarz Academy ; an NGO pioneered by Sarz (a top ranking music producer in Nigeria). Popularly known in the Telecommunications value added services, she has brokered many licensing and publishing deals for host of Artists . Foza also doubles as a business manager for singer Chee. She can be reached via email (officialfoza@gmail.com) or on twitter: @fozadoza. Unwam Oduok is an attorney and Partner at Ebitu Law Group, P.C based in Sacramento California. Her firm has a variety of practice areas but Ms. Unwam’s specific practice areas are Family Law, Business Law(which includes contract drafting, negotiating and litigation), civil litigation and Crisis management for brands, talents and businesses. Ms. Unwam is Licensed to practice in California. She can be reached via email at (unwam@ebitulawgrp.com). Xerona Duke is a litigation and transactional attorney with a specialization in Intellectual Property and Entertainment Law. A musician herself, she has worked with artists in the United States and Nigeria, advising in various areas including publishing, brand recognition and licensing. Licensed to practice law in New York and Nigeria, Xerona holds an LL.B. from the University of Nottingham, and an LL.M. from the University of Pennsylvania. She can be reached via email at (contact@xeronaduke.com) or on twitter at @xeronaduke. 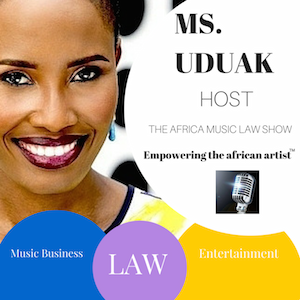 Uduak Oduok, founder of Africa Music Law, is a Partner and Co-Founder of Ebitu Law Group, P.C. where she handle her firm’s intellectual property law, media, business, fashion and entertainment law practice areas. 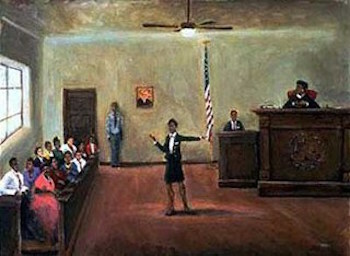 For fifteen years, as an attorney, she has litigated a wide variety of cases in California courts. She has also handled a variety of entertainment deals for clients in the USA, Africa and Asia including network television and licensing deals. Her work and contributions to the creative industry has been recognized by numerous organizations including the National Bar Association, and featured in prestigious legal publications in the USA: ABA Journal and The California Lawyer Magazine. 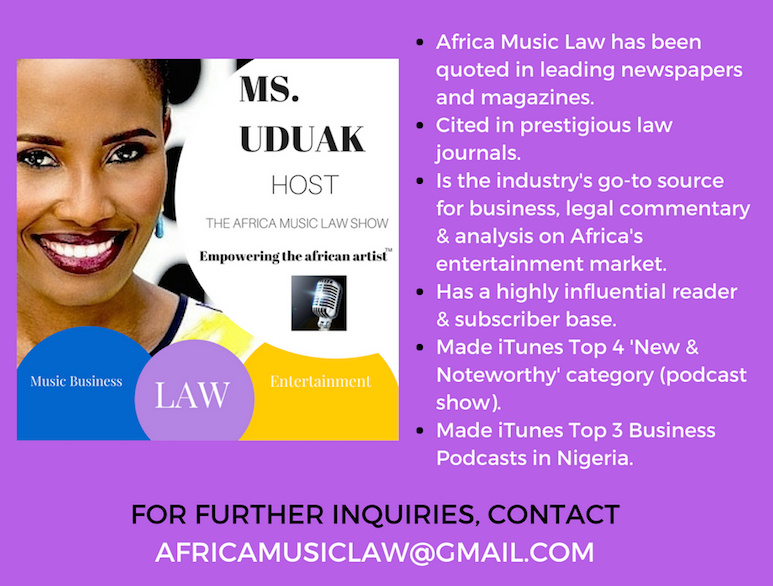 She can be reached via email (uduak@ebitulawgrp.com) or on twitter: @uduaklaw. 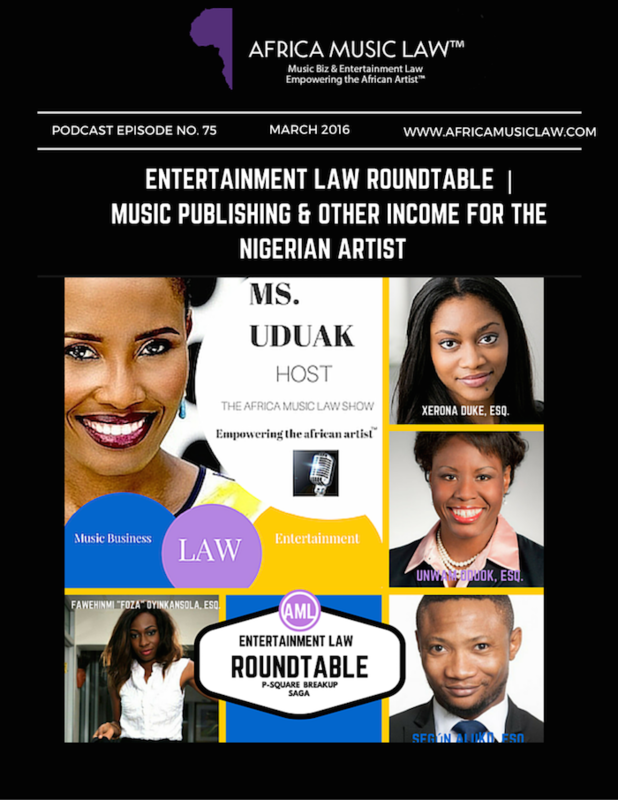 Music publishing for the Nigerian artist. Setting up a music publishing company. Other streams of income for artists: live performances, endorsement deals, sponsorships etc. Xerona Duke | (contact@xeronaduke.com) Twitter: @xeronaduke.